Thanks to Debo Powers for this report . . .
Seventeen people (including 9 members of the North Fork Trails Association) showed up last Saturday morning to work on the Pacific Northwest National Scenic Trail (PNT). The PNT passes through the North Fork on its way from the Pacific Ocean to Chief Mountain on the east side of Glacier National Park. The event was organized by Stephanie Campbell, the regional manager for the PNT. 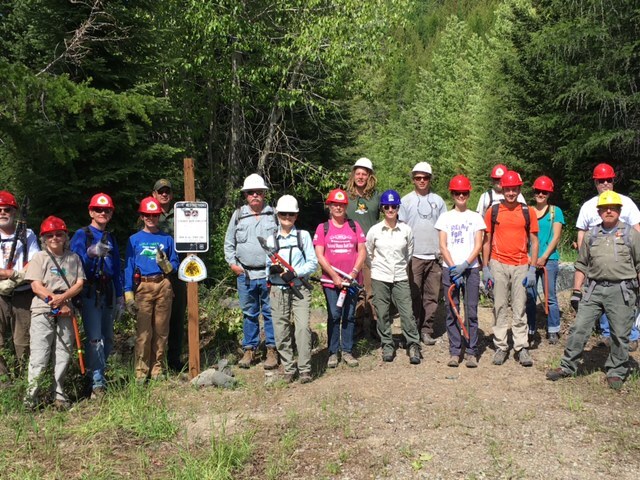 Several members of the Montana Conservation Corp joined other volunteers to work on the trail. A delicious lunch was served for volunteers at the Polebridge Mercantile following the trail work. This entry was posted in News and tagged National Trails Day, Pacific Northwest National Scenic Trail on June 6, 2016 by Bill Walker. Love Trails? Join Us to Get Outside & Give Back! 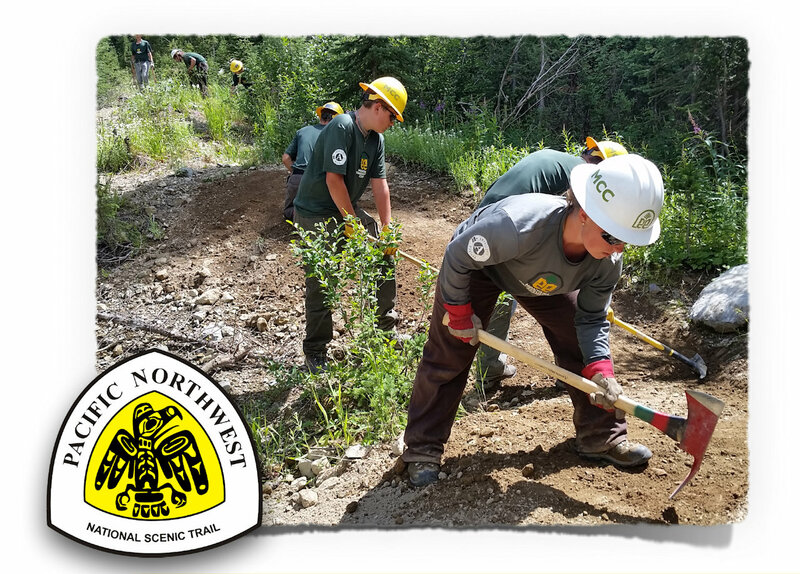 Join the Pacific Northwest Trail Association, Montana Conservation Corps, and the North Fork Trails Association for a day of outdoor fun, stewardship, and community on the Pacific Northwest National Scenic Trail! – Tell me more! : After meeting at Polebridge Mercantile in the morning, we will carpool to the Hay Creek Trailhead, hiking while removing trail brush and obstacles. Be sure to bring your own pack with warm layers, rain gear, and plenty of water and snacks! Long pants and sturdy footwear are a must! – I’m in! But is there food? 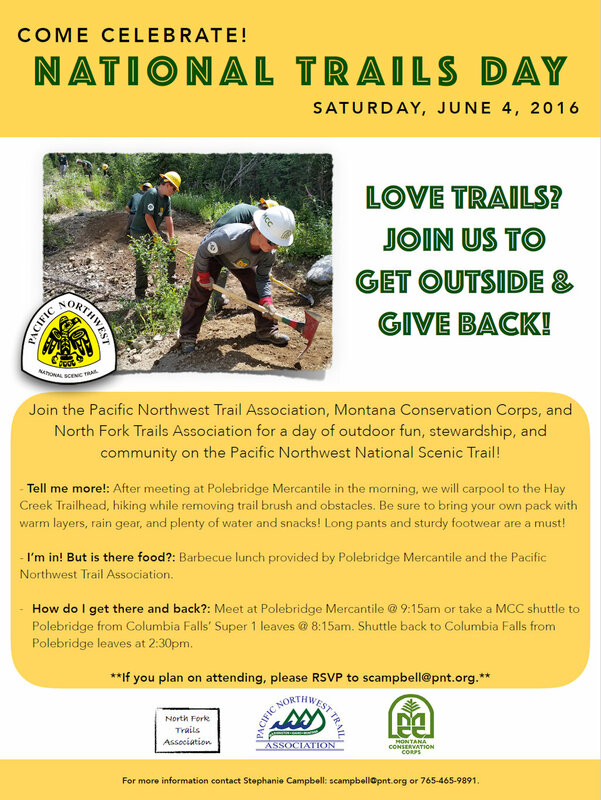 : Barbecue lunch provided by Polebridge Mercantile and the Pacific Northwest Trail Association. – How do I get there and back? : Meet at Polebridge Mercantile @ 9:15am or take a MCC shuttle to Polebridge from Columbia Falls’ Super 1 leaves @ 8:15am. Shuttle back to Columbia Falls from Polebridge leaves at 2:30pm. For more information contact Stephanie Campbell: scampbell@pnt.org or 765-465-9891. Check out the ‘National Trails Day on the Pacific Northwest Trail’ Facebook event page. This entry was posted in News and tagged Hay Creek, Montana Conservation Corp, National Trails Day, Pacific Northwest Trail Association, Trail 3, trail maintenance on May 21, 2016 by Bill Walker.